April Program: MERIDEN’S HISTORY & SETTING INSPIRES ASYLUM with local author Kathryn Orzech. Kathryn Orzech, award-winning local author of Asylum and Premonition of Terror, and, as she describes herself when telling about her website Dreamwatch.com: “Not a Psychic but…”, will talk about how the history of Meriden inspired her and found its way into her book Asylum. This program is co-sponsored by the Meriden Public Library. Book signing will follow the talk. Admission is free so bring a friend! AT THE ANDREWS HOMESTEAD: MERIDEN’S CONTRIBUTION TO THE NATION’S WARS. We are getting ready for the May Open House with a special exhibit: MERIDEN’S CONTRIBUTION TO THE NATION’S WARS. The exhibit will cover The Civil War, the Spanish American War, WWI, WWII, the Korean and the Vietnam wars. A special section is set aside to commemorate the 100th anniversary of WWI; another is dedicated to Women of Meriden and their contributions both at home and overseas. The exhibit and open house will be held every Sunday in May from 11:00 am to 3:00 pm AND the following Thursdays: May 4th and May 18th – 5:00 pm to 8:00 pm. On Sundays shifts run 11:00 – 1:00 and 1:00 to 3:00 and/or any of the two Thursdays 5:00 – 8:00 shift. Visit us under the tent at the Daffodil Festival giant tag sale Saturday, April 22, 2017 and show your support! 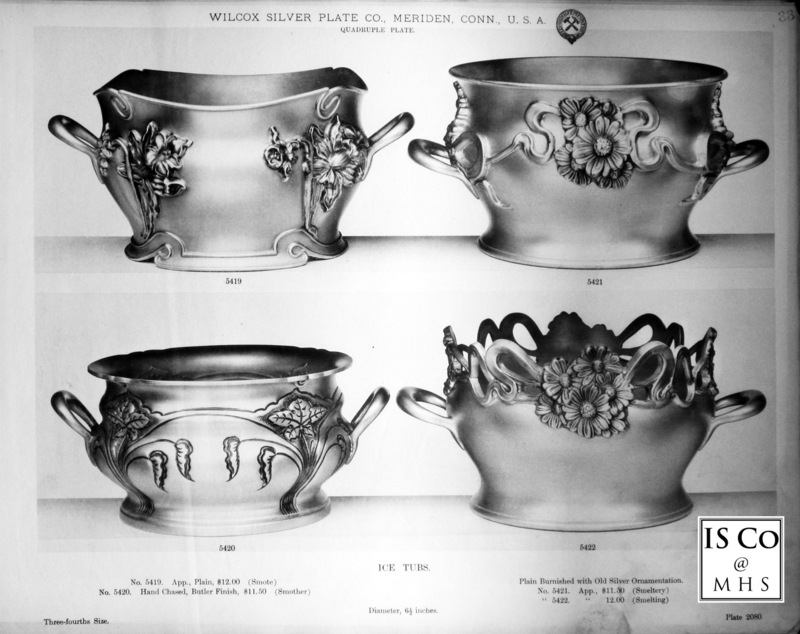 Work on the cataloging of the International Silver Company Archives is progressing with over 70 trade catalogs, brochures and binders of information photographed or scanned and listed. This amounts to approximately 8,000 pages of information from the Meriden Britannia Co., International Silver Co., Meriden Silver Plate Co., Middletown Plate Co., Simpson Hall, Miller & Co., Wilcox Silver Plate Co. and a couple of other catalogs from companies that were not part of IS but are included in the archives. (Companies that either sued or were sued by Meriden Britannia Co. over design or trade mark issues). In addition to compiling the inventory information into a spreadsheet list, work is under way to develop an easy to use a computer interface based upon web technology. This will facilitate easier access to the digital files for research purposes while helping to preserve the originals. A beta version is almost ready to be set up at the Research Center. Since we are at the beginning of spring, a few items found within the archives seem appropriate to share in this April newsletter. For baseball fans we have this photo of a custom made, sterling silver baseball. It was likely commissioned to commemorate William Harridge becoming president of the American League. Its whereabouts is unknown but the Meriden Historical Society has a silver baseball bat in the collection that can be seen at the Andrews Homestead. For the nature minded, Meriden will be celebrating the 39th Annual Daffodil Festival at the end of the month of April but daffodils have been immortalized in silver for many years by the divisions of the International Silver Company. In addition to the classic 1950s ‘Daffodil’ flatware and hollow ware marketed under the 1847 Rogers Bros. mark, the Wilcox division made a number of hollow ware pieces decorated with a patented cast daffodil ornament that was applied to the surface rather than being embossed. A design patent was issued to Seth William Babbitt of Meriden on August 12, 1902 which shows a fully opened flower, a bud and leaves. We thank Emily Belanger, Martha Colaresi, Margaret Jenkins, Helen Reid, John Rush, Patricia F. Singer, and The Center for 20th Century Texas Studies.